Found her on the 1920 Rabbitville, Clinch, Georgia census (dist 62 img 6) as Carrie Finger age 34. Found her on the 1930 Precinct 5, Polk, Florida census (dist 12 img 33) as Carrie Finger age 44. Father, mother born Georgia. Found her on the 1935 Polk, Florida state census (precinct 36 img 141) as Carrie Finger age 49. Found her on the 1940 Buffalo, Erie, New York census (dist 64-359 img 30) as Delia Scherer age 57, widow. Found her on the 1930 Florence, Florence, Wisconsin census (dist 5 img 29) age 64. Found him on the 1880 Hastings, Oswego, New York census (dist 238 img 7) age 59, farmer. Found him on the 1900 Cicero, Onondaga, New York census (dist 40 img 15) age 79, widower, living in the household of his daughter Cornelia and her husband John Littleboy. Found her on the 1892 Benton, Yates, New York state census (E.D. 01) as Margaret Finger age 23. Found her on the 1910 Jerusalem, Yates, New York census (img 19) age 41, born Canada. Father born unknown, mother born England. Many of her children's census entries show her as mother, born Canada. The funeral of Judson Carvey was held at his late home on Monday afternoon. Many friends and old neighbors from here attended. - Pen Yann Democrat November 7, 1930 page 6. Found him on the 1870 Jerusalem, Yates, New York census (img 3) as Judson P. Carvey age 15, works on farm. Found him on the 1880 Jerusalem, Yates, New York census (dist 218 img 3) as Judson Carvey age 25, farmer. He is a son-in-law in the household of Walter Henderson age 50. Found him on the 1920 Jerusalem, Yates, New York census (dist 177 img 5) as Judson Carvey age 65, farmer. Found him on the 1930 Jerusalem, Yates, New York census (dist 9 img 16) as Judson P. Carvey age 75. Father: Austin Alvin CHAPMAN Jr.
Found her on the 1880 St. James, Phelps, Missouri census (dist 123 img 4) as Eliza Finger age 30. Found her on the 1900 St. James, Phelps, Missouri census (dist 101 img 1) as Eliza J. Finger age 49. Found him on the 1870 Caldwell, Catawba, North Carolina census age 23. He and his family are living with her parents Elisha and Eliza Ramseur. Also listed with his family is Peter England age 10, black, farm laborer. Found him on the 1880 Davidson, Transylvania, North Carolina census (dist 186 img 13) age 32, farmer. Carl P. Finger, 77, of 103 S. Main St died yesterday (May 1, 1967) in Lakeview Memorial Hospital, Brockport, following a short illness. Born in the town of Kendall, he had resided in this area all his life. He engaged in farming until retirement. Survivors are three daughters, Mrs. Donald Hastings and Mrs. Everett Cady, both of Holley, and Mrs. John Smith Jr. of Charleston, W.V. ; two brothers George and Gustav, both of Rochester; two sisters, Mrs. Roy Grubie of Charleston and Mrs. Morris Dickmann of Rochester; 13 grandchildren and several nieces and nephews. Rochester Democrat and Chronicle May 2, 1967. Also found on the 1905 Rochester, Monroe, New York state census (E.D.02 img 24) as Charlie P. Finger age 15. He is in the correct household with his family. His WWI draft registration card says he has a dependent wife, child, father, mother. Found him on the 1920 Albion, Orleans, New York census (dist 159 img 17) as Carl Finger age 30, farmer. Found him on the 1930 Murray, Orleans, New York census (dist 20 img 12) as Carle Finger age 40, farmer. Found him on the 1940 Murray, Orleans, New York census (dist 37-20 img 1) as Carl Finger age 50, farmer. In looking at his children's birth places, it shows he moved from New York to Connecticut between 1922 and 1924. On his WWI draft registration he lists his occupation as vinyardist, self employed. On his WWII registration card (1942) his address is 19 Wooster Street Bethel, Connecticut. His place of birth is Branchport, New York and his wife's name is Mrs. York Finger. (Branchport is just southwest of Penn Yan) He is employed by the Town of Bethel. Found him on the 1900 Jerusalem, Yates, New York census (dist 138 img 12) age 4. Found him on the 1910 Pulteney, Steuben, New York census (dist 153 img 9) age 14. Found him on the 1920 Bethel, Fairfield, Connecticut census (dist 1 img 27) as Clyde Elfinger age 24, single, living with his sister Mary and her husband Warren Wood. Found him on the 1930 Bethel, Fairfield, Connecticut census (dist 98 img 18) as Clyde M. Finger age 34, realtor. Found him on the 1910 Grover, Marinette, Wisconsin census (dist 76 img 8) as Frank Finger age 5 months. Found him on the 1920 Grover, Marinette, Wisconsin census (dist 135 img 6) as Frank Finger age 10. Found him on the 1930 Grover, Marinette, Wisconsin census (dist 9 img 15) as Frank Finger age 20. Found him on the 1880 Livingston, Columbia, New York census (dist 23 img 18) as Frank Fingar age 18. Found her on the 1900 Justice Precinct 2, Hall, Texas census (dist 9 img 3) as Georgia M. Finger age 12. On his WWII draft registration (1942) his wife is Ethel S. Finger. He is employed by the American Blankbook Co., Boston, Mass. His address is 14 Mystic Ave. Winchester, Mass. He is referred to as John A. Finger of Boston, Massachusetts in his sister Mabel's obituary. - 1938. He is referred to as John A. Finger of Winchester, Massachusetts in his sister Henrietta's obituary. - 1959. Found him on the 1900 Saugerties, Ulster, New York census (dist 132 img 9) age 12. Found him on the 1910 Saugerties, Ulster, New York census (dist 164 img 32) as John Finger age 21, single, bookkeeper, paper mill office. Found him on the 1920 Medford Ward 2, Middlesex, Massachusetts census (dist 314 img 26) age 33, manager, book bindery. Found him on the 1930 Winchester, Middlesex, Massachusetts census (dist 542 img 16) age 42, manufacturer, book bindary. All data from Dr. Ulrich Stöhr in a letter dated Aug 24, 2003. Found him on the 1850 Warren, Somerset, New Jersey census age 1. 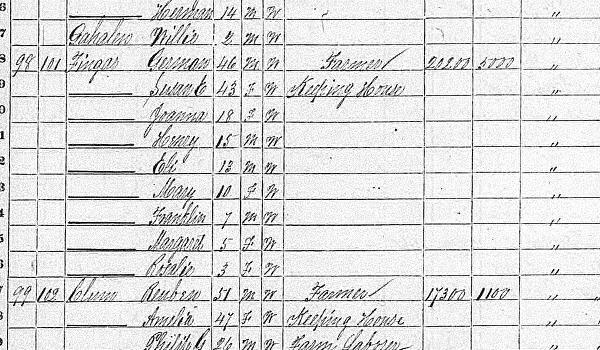 Found him on the 1860 Warren, Somerset, New Jersey census (img 13) age 11. Found him on the 1880 Piscataway, Middlesex, New Jersey census (dist 131 img 17) age 30, baker. His brother Peter, age 26, is living with his family. Found him on the 1900 Cranford, Union, New Jersey census (dist 91 img 6) as Michael Finger age 50, baker. No children. Found him on the 1920 Cranford, Union, New Jersey census (dist 58 img 9) age 70. Also in his household is Mary Getz age 72, sister-in-law. Found him on the 1920 Danbury Ward 2, Fairfield, Connecticut census (dist 101 img 6) age 9. Found him on the 1930 Danbury, Fairfield, Connecticut census (dist 102 img 14) age 19, drafter, machine shop. Found her on the 1880 (not stated), Tarrant, Texas census (dist 92 img 1) as Christina Harrison age 16. Family 1 : Laura E.
Found him on the 1900 Council Grove, Morris, Kansas census (dist 191 img 7) age 47, farmer. Found him on the 1860 (not stated), Lincoln, North Carolina census (img 68) as Luther Rudisill age 6. Found him on the 1880 Ironton, Lincoln, North Carolina census (dist 101 img 6) as Luther Rudisail age 24. He, his wife, and children are living with his father Solomon Rudisill. Found him on the 1900 Ironton, Lincoln, North Carolina census (dist 109 img 4) as Luther M. Rudisill age 46, farmer. Found him on the 1910 Ironton, Lincoln, North Carolina census (dist 69 img 3) as Luther M. Rudisill age 56, farmer. Found him on the 1920 Ironton, Lincoln, North Carolina census (dist 104 img 9) as Luther M. Rudisill age 65, farm laborer, general farm. Found him on the 1930 Ironton, Lincoln, North Carolina census (dist 9 img 8) as Luther M. Rudisill age 75, farmer. Found her on the 1920 Salina, Onondaga, New York census (img 18) as Catherine Schiesser age 6. Found her on the 1930 Salina, Onondaga, New York census (dist 182 img 2) as Catherine Schiesser age 17. Found her on the 1900 Maple Creek, Outagamie, Wisconsin census (dist 91 img 8) as Minnie Finger age 27. Found her on the 1920 Matteson, Waupaca, Wisconsin census (dist 130 img 20) as Minnie Finger age 43. Found her on the 1930 Matteson, Waupaca, Wisconsin census (dist 26 img 14) age 54. Found him on the 1910 Princeton, Mercer, New Jersey census (dist 42 img 20) as Chester Task age 16. Found him on the 1920 Princeton, Mercer, New Jersey census (dist 45 img 14) as Chester Task age 25. Found him on the 1900 Clermont, Columbia, New York census (dist 10 img 11) as John J. Tinklepaugh age 23, cooper. Found him on the 1910 Clermont, Columbia, New York census (dist 9 img 10) as John J. Tinklepaugh age 33. Manufacturer, fruit barrels. Found her on the 1880 Artesia, Iroquois, Illinois census (dist 120 img 1) age 5. Found her on the 1940 Other Places, Davidson, Tennessee census (dist 19-22 img 33) as Murphie E. Finger age 28. Found her on the 1850 District 4, Bedford, Tennessee census (img 11) as Sarah E. Woods age 11. She is not listed with the family in 1860. Found him on the 1900 Germantown, Columbia, New York census (dist 13 img 34) as Clarence Yager age 8.